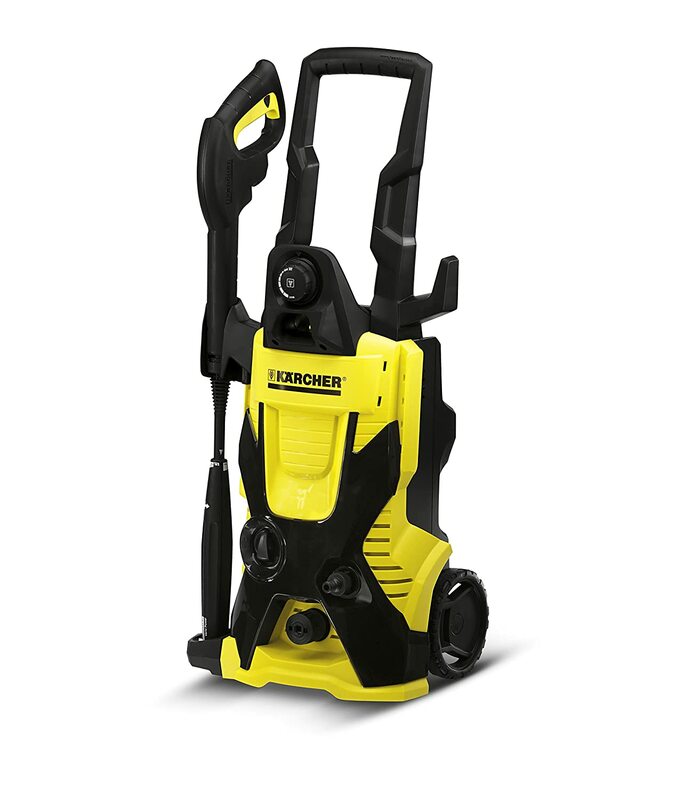 The Karcher K3.540 is a mid-level electric pressure washer from its X-series range. It features slightly less pressure than the K5.540 model but comes with the same induction motor and direct drive axial cam pump. In fact, design wise, the two models are similar with a DirtBlaster Spray Wand and VPS Wand. Even the onboard detergent storage tank is located at the same spot with similar actions. Naturally, the K3.540 also suffers from the same problems as seen in the K5.540. Changing wands, hose or connections is easy thanks to the quick connect points. Moreover, operating the VPS wand lets you spray a low-pressure pattern that is ideal for applying detergent while the DirtBlaster lets you utilize the maximum pressure produced by this electric pressure washer. Operating this machine is simple and because of its lightweight nature, you can cart it around wherever you go. The manual and startup guide is detailed, giving a lot of safety, care, and operating information. While the K5.540 model tends to fall flat in terms of actual PSI, the Karcher K3.540 actually delivers around 1800PSI, which in its price range is impressive. The induction motor purrs to life with the push of a button. When you release the trigger on any wand, the motor shuts down. The difference in noise levels with the motor turned off and turned on is marginal at best. This particular model from Karcher is possibly the quietest of them all. Unlike the top of the line K5.540 model from Karcher, the K3.540 actually delivers the promised 1800 PSI at 1.5 GPM. You can literally feel the power coming out from the DirtBlaster wand. And because the motor is activated only when you press the trigger on the wand, you know that the motor and pump are going to continue performing at optimum levels for a really long time. Moreover, considering its affordable price tag, you are getting a lot of power with very little noise. this happens, be ready to order in replacement connectors as every connection and tip on this Karcher pressure washer is made from plastic. With consistent usage, you will eventually wear out the tips and the wand. Thankfully, replacement parts for the K3.540 do not cost much. I said that Karcher has great customer support when talking on the K5.540. Well, I am going one step further and applauding Karcher for helping me out even before I purchased their product. I called up their customer support to get a clarification as to what exactly makes the K3.540 different from the K5.540 and they were happy to give me the details. This being a mid-level product is given a slightly smaller motor but to compensate for the decreased pressure they have increased the GPM. The lady on the phone was sweet and respectful, something that I always admire in any tech support team. Patented Self Priming Pump design from Karcher. Residential usage design with a high-pressure output of 1800 PSI at 1.5 GPM. Comes with onboard detergent tank, accessory storage area, water-cooled induction motor and quick connect system. Upright catchy design and 1-year limited warranty. Two wands with a trigger gun and assortment of accessories packaged along with the unit. Great backup pressure washer, lightweight, easy to move around, use and maneuver. The off switch on the wand shuts down the motor thus prolonging pump and motor life. Plastic tips and spray wands tend to disintegrate over time. Unbalanced upright position causes it to fall down often. The Karcher K3.540 definitely is no long haul power tool. It is designed to be a suitable replacement for cleaning within the house. Where your gas powered washer can’t go, this one will definitely serve its purpose. However, as a standalone pressure washer, be sure to use it only with light tasks. This means restrict yourself to cleaning cars, driveways, furniture and the likes. Anything that requires continuous use of the DirtBlaster wand is not compatible with this particular model because of its lack of power. Having said that, I believe this is a handy washer to have around the house. Besides its cheap too!